The 2011 Chevrolet Volt, an innovative plug-in hybrid, received not one but three different mileage ratings from the U.S. EPA Wednesday. On electricity alone, the Volt achieves the equivalent of 93 mpg (2.5 liters per 100km). General Motors Co. has been touting the Volt for four years now and often refers to it as a technological showcase. GM's European unit has started taking reservations for the Opel/Vauxhall Ampera -- a rebadged Volt. Deliveries will begin in October 2011. The four-passenger car can travel on battery power alone and offers additional driving range when assisted by a 1.4-liter gasoline engine. The car has already received numerous awards, including Green Car Journal's Green Car of the Year. The EPA said the Volt has a 35-mile (56km) range on electricity alone and a range of 379 miles with gasoline and electricity. GM had been saying that the Volt had a range of 35-50 miles on one full battery charge. “We have said that the range is variable on how you drive,” Doug Parks, GM's vehicle line executive in charge of the Volt, said during a conference call Wednesday with the press. The Volt falls into the EPA compact vehicle segment, which includes models such as the Ford Focus, Chevrolet Cruze and Toyota Corolla.The Volt's mpg rating was rated as best in the compact class by the EPA. Since the Volt is using technology that no other automaker currently offers, a new mileage label was created by the EPA with input from GM. “The label helps customers understand the uniqueness of the Volt and how it applies to their routine,” said Scott Miller, vehicle performance manager for the Volt. 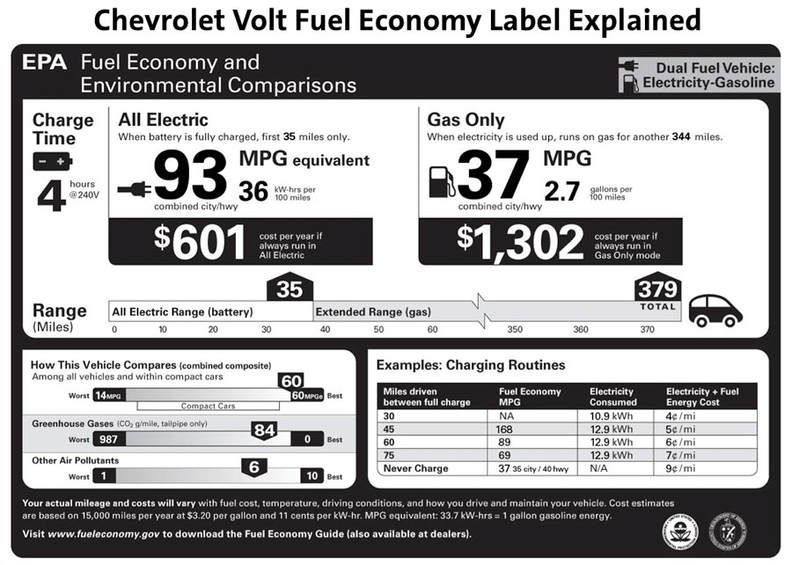 The Volt is the only 2011 vehicle that will use this label. However, although it has not been determined by the EPA, the label is expected to be used by other automakers that offer similar powertrains, Parks said. The label is not expected to be used for just one model year, discarded and replaced with something different for 2012. GM has said the combination of a pure electric drive motor and an efficient, range-extending engine, will give the Volt up to 350 total miles of range. The label lists what it calls “charging routines,” essentially estimates for the cost of electricity and gasoline based on the number of miles driven between charges. For example, a Volt owner living in an urban area who travels 30 miles between charges, would use no gasoline, the EPA estimates. The vehicle would consume 10.9 kilowatts of electricity for an estimated cost of four cents per mile. That contrasts with a Volt owner who travels 75 miles between a charge and uses gasoline. The EPA estimates 12.9 kilowatts of electricity would be used, in addition to gasoline, for a combined estimated cost of 7 cents per mile. The EPA estimates fuel economy at 69 miles per gallon. Earlier this month, Tom Stephens, GM's global product chief, said Chevrolet would begin shipping the Volt to dealers as soon as the EPA issued a mileage label for the vehicle. Parks declined to say when shipments would begin, however. GM's Detroit-Hamtramck assembly plant has built Volts for shipment since early November. The car will go on sale initially in Michigan, California; metropolitan New York; Austin, Tex. ; and Washington, D.C. before it is available in the rest of the country by 2012. It has a base price of $41,000, including shipping, before a $7,500 federal tax credit. GM's European unit will sell the Opel/Vauxhall Ampera for 42,900 euros (about $58,600). The company said it has started taking reservations for the Ampera. GM will launch the Volt in Europe late next year, around the same time as the Ampera. GM has not revealed the Volt's price in Europe. The Volt is the most aerodynamic vehicle GM has produced, Stephens said. GM had said the Volt can travel 25 to 50 miles on battery power alone and offer additional driving range of 310 miles when assisted by a 1.4-liter engine with a full tank of gasoline. “The Volt does everything we said it was going to do the very first day we announced it — and more,” Stephens said earlier this month. “If you recall back then how many people were saying that they don't even have a battery, they don't have motors or any of this, can this be real? Stephens said GM is maintaining its plan to produce 10,000 Volts through 2011 and 45,000 in 2012. However, that number could change depending on customer demand and the ability of suppliers to provide parts for the vehicle, he said. But there are early signs the car will see widespread demand. 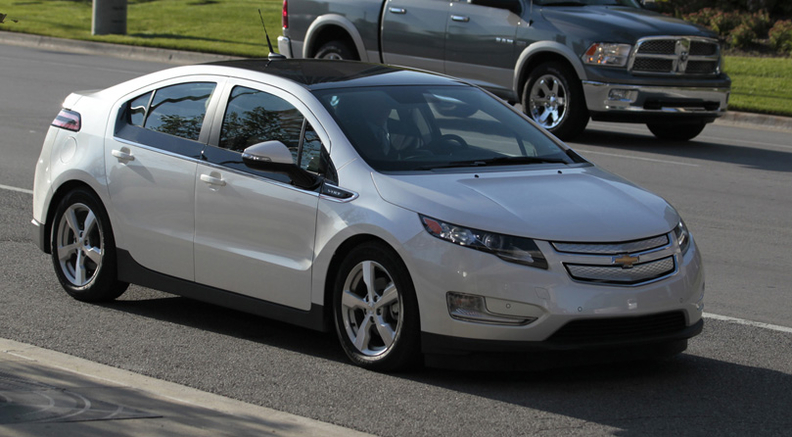 General Electric Co., for example, has committed to purchase the Volt for fleet use. Earlier this week, the EPA announced the fuel economy rating for the Nissan Leaf, an electric-powered four-seat vehicle. The EPA label on the Leaf will display a fuel economy equivalent of 99 mpg when it goes on sale next month. The battery-powered Leaf uses no gasoline or oil, and has no combustion engine or fuel tank. The Leaf received a “best in class” ranking for mid-sized vehicles. Nissan had said that the Leaf would get up to 100 miles of driving on a full charge. However, the EPA put the range at 73 miles. The Leaf goes on sale next month in five U.S. states. Deliveries in Europe start in early 2011 in the UK, Ireland, the Netherlands and Portugal.